CONTEMPLATE THIS…Instead of turning away people who practise Dorje Shugden, we should be kind to them. Invite them, teach them, slowly and give them logic and wisdom without fear, then in time they give up the practice assuming it is ‘wrong’. Wouldn’t that be a Buddhistic approach to all ‘wrong-doers’? Actually Dorje Shugden practitioners are not doing anything wrong. But hypothetically, if they are, wouldn’t it be a better and more true to the spirit of Buddhism to be accepting? So those reading this website who have views against Dorje Shugden should contemplate this. Those who are practicing Dorje Shugden should forbear with extreme patience, fortitude and keep your commitments. The time will come as predicted that Dorje Shugden’s practice and it’s terrific quick benefits will be embraced by the world and it will be a practice of many beings. Many beings who have said or thought negativities against this protector will regret and see the benefits and enlightened nature of Lord Dorje Shugden, King of the manifested deities who resides simultaneously in the Three Worlds…After all, if H.H. the Dalai Lama can say that his guru Kyabje Trijang Rinpoche is wrong in this practice, then he leaves the door wide open that His Holiness Himself can be wrong also. What would make His Holiness right and His Guru wrong?? If His guru can be wrong, then disciples of the Dalai Lama can say that the Dalai Lama is wrong also. If we choose that view, it becomes messy. So we have to think that outwardly His Holiness puts his ‘reputation’ on the line to speak out ‘against’ Dorje Shugden in His skillful means to not create fear in the hearts of sectarian people who use the holy lineages of Nyingma, Kagyu, Sakya and Gelug against each other. As the destruction of any lineage or deterioration would set the example for other lineages. They are somehow interdependent. We at this website respect His Holiness the Dalai Lama from the depths of our hearts and at the same time follow our golden vajra commands of our lamas we met previous to His Holiness the Dalai Lama. The commitments of Dorje Shugden we have received from our root and lineage lamas prior to His Holiness must be upheld also. All those great lamas who are also the lineage lamas of His Holiness cannot be wrong. If they are, then the other practices, lineages, initiations, transmissions passed to His Holiness would be ‘stained’ by the practice of Dorje Shugden also? 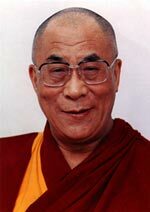 So for example, His Holiness kindly confers the Kalacakra many times throughout the world. He has received this lineage from Kyabje Ling Rinpoche. Kyabje Ling Rinpoche’s root lama is Kyabje Pabongkha Rinpoche Jetsun Dechen Nyingpo recognized as the emanation of Heruka Cakrasamvara. Every great Gelugpa lama is directly or indirectly connected to this great being. Kyabje Pabongkha Rinpoche practised Dorje Shugden throughout his holy life. So if his practice is wrong, then he would be a wrong lineage lama to Kyabje Ling Rinpoche. If that is wrong, then His Holiness is passing practices that are so called ‘impure’ to many today. That is impossible. His Holiness is definitely pure as well as His lineage lamas, for example Kyabje Pabongkha Rinpoche. Even His Holiness could not override any master of any school of Buddhism or any sect, otherwise His Holiness would put Himself in the position of being eventually overridden also. Who would want to do that? All the many lineage masters who practiced Gyelchen Dorje Shugden in their previous incarnations are back and studying/teaching again. 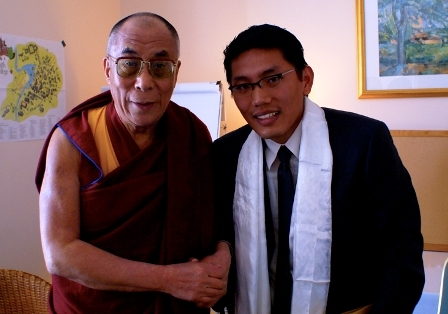 Many have been recognized by the oracle of Dorje Shugden and His Holiness the Dalai Lama himself. So why are they back?? Shouldn’t they have taken unfortunate rebirths?? Below is a beautiful prayer to the Dharma Protector Dorje Shugden as composed by H.H. the 14th Dalai Lama in the mid 70′s..His Holiness at that time and now is of the same mindstream, free of mistakes as He is the Bodhisattva Avalokitesvara. Those of you who have tremendous obstacles, fearful situations, desperate predicaments, financial woes that hinder your dharma growth and practice should engage in the tremendously quick and efficacious practice of Dorje Shugden. It must be combined with pure Guru devotion, consistent practice of one’s yidam, holding one’s vows and words of honor, no harm should be done to others, respect of all lineages and lineage lamas, teachers and masters. Forgive and forbear those who show enmity and disdain. For that would please the holy mind of the Dharmaphala King of the Three Lokas, Gyelchen Dorje Shugden. Even if one has no confirmed practice, lama or vows, still with good motivation, if one propitiates this holy protector, one can see the benefits. Like anything with time, the help, and mystical intervention of this supreme being will be felt more and more obvious. Especially if one is on the path of the cultivation of Lam Rim realizations. Put your energies not into worry, despair, depression, unnecessary wastage of time, but channel it into the modernly adapted yet supreme practice of this protector. Come from the abodes of Tushita, Kechara, and so forth! This, A Propitiation of Mighty Gyalchen Dorje Shugden, Protector of Conqueror Manjusri Tsongkhapa’s Teachings, entitled Melody of the Unceasing Vajra ’s composition was urged, not only by the vajra prophecy of the great emanated Dharmapala himself, but also on behalf of the general community by the master of the Dratsang and all of its officers, with offerings. Accordingly, the one called Holder Of The White Lotus, Bearer of the Buddhadharma, Ngawang Losang Tenzin Gyatso Sisum Wangyur Tsungpa Mepa De composed it at Dungkar Monastery with spontaneous auspiciousness. Domo Geshe Rinpoche, at whose Dunkar Monastery His Holiness composed these inspiring verses, was one of the greatest Mahasiddhas in Tibetan history. A greater example of saintliness and, mind you, non-sectarian compassion would be hard to find. Kyabje Trijang Dorje Chang said of him, “We are exactly the same”, and Domo Geshe put his Monasteries in Kyabje Trijang Rinpoche’s care before he passed on. The 13 th Dalai Lama praised him as Je Tsongkhapa incarnate. Both the 13 th and the 14 th Dalai Lama praised Dungkar Monastery’s oracle, through which they obtained very valuable advice in difficult times. This prayer shows beyond the shadow of a doubt the enlightened origin and the “holy mind” of the King Protector as seen by His Holiness. No “ghost” can come from Tushita and Kechara, Maitreya and Vajrayogini’s pureland. No “ghost” can cause you to “soar the path of immortal liberation on unified wings of Sutra and Tantra”! Seeing this, we think it is safe to conclude what this conflict is not about. And who knows, maybe it is not a conflict at all, except in our conflict-hungry minds that can’t stand the notion of interdependence and cause and effect?